Angela Ables is a Director and President of the firm. 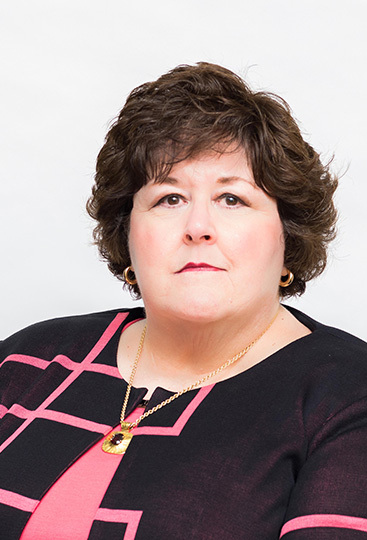 Ms. Ables’ practice focuses on regulatory law and for over thirty years she has represented and advised the insurance industry and attendant entities in regulatory matters, administrative proceedings, transactional matters, strategic legal issues, litigation, and appellate matters. During college, Ms. Ables worked for Carl Albert, Speaker of the U. S. House of Representatives, in his Washington office, where she learned the art of negotiation and witnessed the inner workings of government first hand. Ms. Ables served as an Assistant Attorney General for the State of Oklahoma from 1976 to 1979, after serving as the Attorney General’s Administrative Assistant from 1972-1976. She also served as the Deputy Insurance Commissioner from 1979 to 1985. Ms. Ables left the State of Oklahoma employ in 1985 to join the law firm of Kerr, Irvine & Rhodes. In 1988, she became a partner and the firm became Kerr, Irvine, Rhodes & Ables. Ms. Ables has been active in the community and state and serves on the Board of Directors of Oklahoma Attorneys Mutual Insurance Company where she is presently serving as Vice-Chairman. She has served as Chairman of the Oklahoma Bar Association Group Insurance Committee from the year 2000 to the present and has been a Fellow of the Oklahoma Bar Foundation since 2004. Ms. Ables is a member of the ECU President’s Circle, a Lifetime member of the ECU Alumni Association, a member of the BancFirst Community Board of Directors and is Director Emeritus to Lyric Theatre where she served as President for two terms from 1996-1998. Ms. Ables was appointed by Oklahoma’s Governor to serve on the State Election Board and served as Vice Chairman from 1985-1988. She was also appointed by the Oklahoma Insurance Commissioner to serve as a Board member of the Oklahoma High Risk Pool. Ms. Ables represents insurers, third party administrators, brokers, captives, service warranty associations, producers, and adjustors before state and federal regulatory bodies, including the Oklahoma Insurance Department, the Oklahoma Securities Commission, and the Oklahoma Banking Department. Ms. Ables represents the insurance industry in agency investigations and adjudicatory matters, including hearings before Administrative Law Judges and Hearing Officers, as well as handling appeals from agency decisions. She also represents insurers in matters before the Oklahoma Legislature and in the administrative rule-making process before the Oklahoma Insurance Department and other state agencies. Ms. Ables counsels the insurance industry in a wide variety of regulatory compliance issues. She also prepares licensure filings for insurance companies with the Oklahoma Insurance Department through the U.C.A.A., as well as rate and form filings. She has vast experience in the drafting of insurance contracts, reinsurance contracts and assumption reinsurance agreements. regulatory filings required by state law. Federation of Regulatory Counsel, Quarterly Journal of Insurance Law and Regulation, June 8, 2002, Vol. IX, Edition II, “Accountant’s New Liability in Oklahoma”. Federation of Regulatory Counsel, Quarterly Journal of Insurance Law and Regulation, September 9, 2000, Vol. XII, Edition III, “Piercing the Corporation Veil In Insurance Bad Faith Cases”.